Across the Interior West, as the sagebrush sea recedes under the environmental stress of human impacts, its emblematic bird, the sage grouse, is also in decline, and no one seems to know what to do about it. 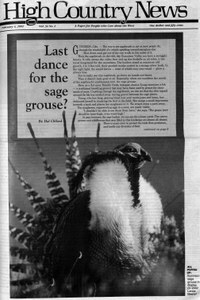 Last dance for the sage grouse? Male sage grouse gather at leks to dance in front of females in elaborate mating displays. Can cows and grouse coexist on the range? Colorado rancher Brad Phelps believes that cattle and sage grouse can live together, but biologists, environmentalists and other ranchers continue to argue over exactly what impact grazing has. The battle over storing nuclear waste at Nevada's Yucca Mountain is heating up in Congress as well as in Nevada and the West. In his new book, "This Sovereign Land," Daniel Kemmis argues that it is time for the national government to give local governments more power over public lands in the West. Blackfeet tribal member and banker Elouise Cobell writes about her legal battle to make the Bureau of Indian Affairs and the Interior Department accountable for millions of dollars missing from Indian trust funds. Why the bad rap for Mormons? A Utah resident wonders why so many non-Mormons have such weird ideas about members of the Church of Jesus Christ of Latter-day Saints. Shipping bee queens; red whine and the gnome project; Area 51 guards on strike; nicer employers in Mexico; Las Vegas showgirls wear even less; mnemonic for Grand Canyon geology; plane spotters unpopular; Utah subs for Mars. Spreading the News; more opinions; HCN meeting in Las Cruces, N.M., hears about life on the border; new interns Julie Elliott and Sarah Wright. Legendary wilderness advocate Celia Hunter dies at the age of 82 in her Fairbanks, Alaska, log cabin. Both environmental critics and Bush supporters complain that the Republican administration is neglecting, even ignoring, the West. Utah's Skull Valley nuclear storage site; Wyoming Game & Fish bails on black-tailed prairie dog plan; lynx-hair fracas continues; Arizona wants to sell power to New Mexico; La Verkin, Utah, repeals anti-U.N. ordinance. In Montana's Centennial Valley, the Beaverhead-Deerlodge forest is delaying a decision to manage as wilderness Mount Jefferson, an area increasingly popular with, and impacted by, snowmobiles. The Colorado Wildlife Commission wants to prevent the spread of chronic wasting disease by requiring all elk imports to be certified as disease-free for 60 months. In Boundary Creek, Idaho, locals are at odds over the flooding of good farmland to create wetlands for the new Boundary Creek Wildlife Management Area. A revision of Grand Canyon National Park's River Management Plan is back on track after former superintendent Robert Arnberger dropped it in 1997 because of the controversy it aroused.